Today we completed the second day of training of health teachers, lecturers in nursng, public health and the like in Kathmandu. 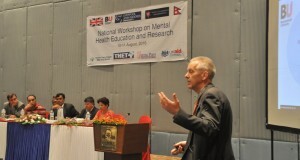 We called it the National Workshop on Mental Health Education & Research and this two-day workshop was held in a hotel in Kathmandu. It was organised by Tribhuvan University in collaboration with Bournemouth University and Liverpool John Moores University (LJMU). 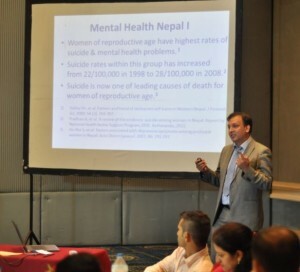 Mental health is high on the global agenda and want to raise the issue more in Nepal. 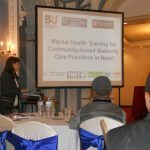 The three universities are working together on an education intervention training Auxiliary Nurse Midwives in Nawalparasi on mental health issues and mental health promotion. The project is funded under the Health Partnership Scheme (HPS) from DfID and managed by THET (Tropical Health & Education Trust). 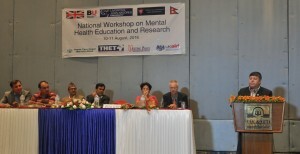 Key speakers on the first day of the workshop included: the VC of Tribhuvan University, Dr Gangalal Tuladhar MP and former Education Minister of Nepal, Dr Khem Karki (head of the Nepal Health Research Council), Dr Chandra Kala Sharma, Prof Shyam Krishna Maharjan and Prof Krishna Acharya. This workshop is part of this capacity building process and the audience of largely university and college lecturers will take some of the learning back with them to improve the education of health workers in Nepal. The second day of the workshop concentrateed on research methods for community-based projects such as this our THET funded one in the mental health field. Prof. Edwin van Teijlingen reminded the audience that it is important that novel mental health interventions like ours are properly evaluated, and that the people doing the evaluations have the appropriate rese arch skills. The next group of UK volunteers are due to travel to Nepal in September.